Liss Waters Hyde tells the story of an Unfair Labor Practice complaint filed against the New York IWW which did little to deter the branch from pursuing justice for migrant workers. Filing an Unfair Labor Practice (ULP) should rarely be relied upon as the sole means of resolving an issue with an employer. To illustrate this, I’ll share the story of a ULP filed against the Industrial Workers of the World (IWW) for illegal picketing, which demonstrates why ULP settlements can be ineffective and, at times, laughable. An Unfair Labor Practice, or ULP, is a complaint you can file if your legal rights under the National Labor Relations Act (NLRA) have been violated. As organizers, we usually think of a ULP as being filed by workers in the course of an organizing campaign. After all, the NLRA restricts employers from interfering with workers’ rights to participate in a union, and from retaliating against workers who file grievances. However, employers can also file ULPs against unions, because the NLRA also restricts unions from certain activities, such as coercing workers to participate in the union, engaging in bad-faith collective bargaining with the employer, and participating in illegal strikes or boycotts, including secondary boycotts or pickets. The process for filing a ULP and receiving a decision from the National Labor Relations Board (NLRB) is slow-moving and may not ever result in any acceptable resolution. Even in cases where a settlement is reached, the agreement won’t necessarily resolve the original issue. Furthermore, the NLRB is governed by a five-person General Counsel whose members are appointed by the U.S. President, so decisions will vary depending on what administration your ULP is filed under. 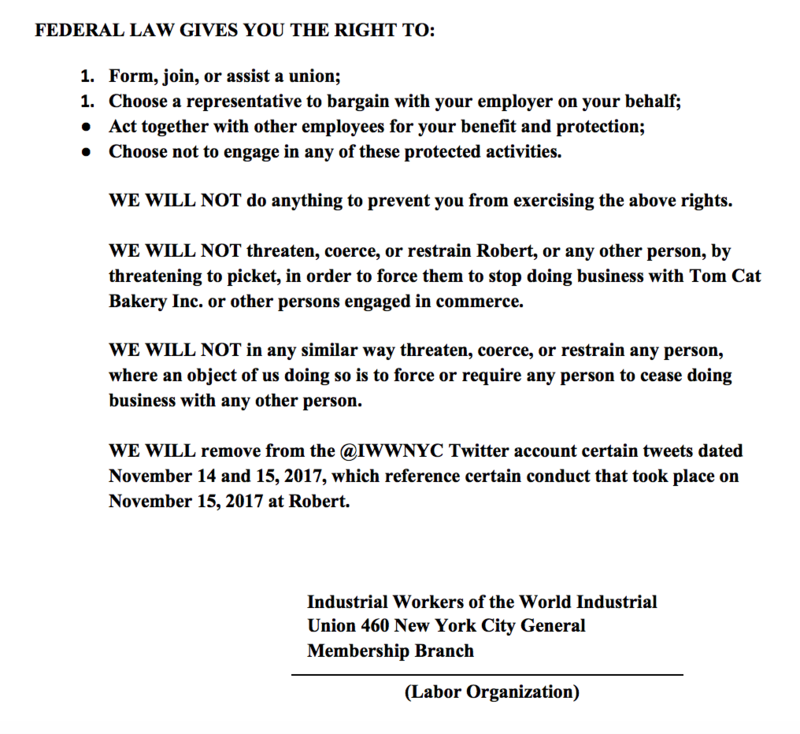 In November of 2017, Tom Cat Bakery filed a ULP against the New York City General Membership Branch (NYC GMB) of the Industrial Workers of the World. 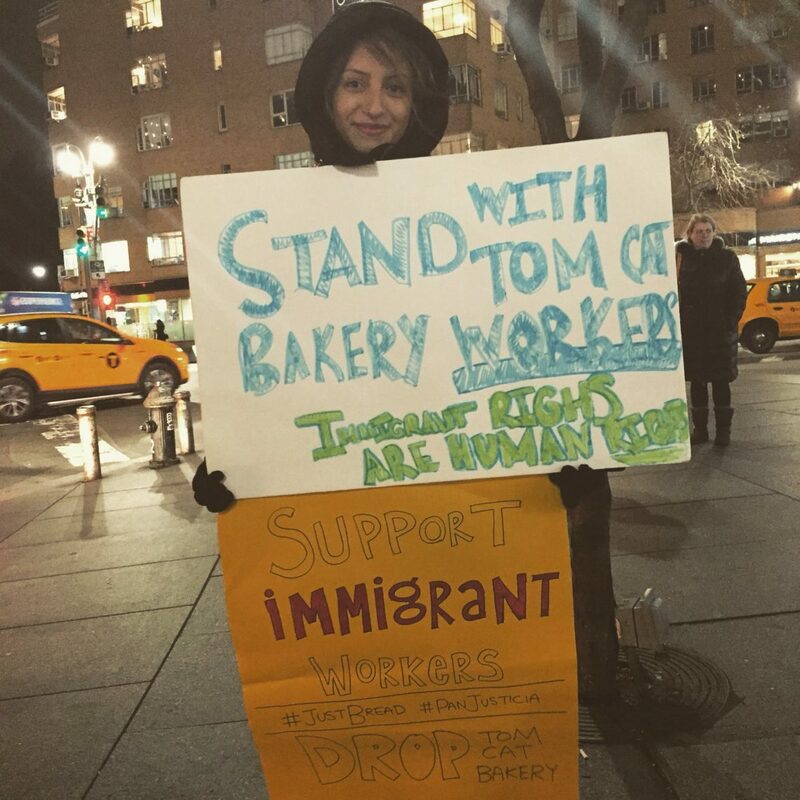 Back in 2016, Tom Cat Bakery was subject to an I-9 audit from Immigration and Customs Enforcement (ICE) — the first ICE audit in NYC in 10 years. The company terminated the employment of around 30 workers, the majority of whom had been with the company for 10 years or more. Ever since, a coalition of allies, led by the workers, has been fighting for a fair severance for those who were laid off and for Tom Cat to adopt a set of guidelines put forth by the legal worker advocacy group National Employment Law Project, to protect current and future employees from ICE. When the bakery refused to negotiate, allies of the workers began educating the restaurants that purchase Tom Cat’s products about the workers’ story. Many restaurants chose not to purchase bread from Tom Cat until the bakery sits down with the workers. Other restaurants chose not to stand in solidarity with the workers, so allies began handing out flyers to customers outside of those restaurants, explaining the workers’ situation. During one consumer education event, the manager of Robert restaurant here in NYC was filmed screaming at volunteers who were giving out flyers outside of the restaurant, and snatching a stack of flyers from one participant’s hand and attempting to rip up the papers. I posted the video to my personal Twitter account and tagged one of the ally groups that I had been co-managing social media for. To date, the video has been viewed over nine thousand times and retweeted 164 times. It was also reuploaded by several other accounts. One of the Twitter accounts that initially retweeted the video belonged to the IWW NYC GMB. Robert restaurant complained to Tom Cat Bakery, who then filed a ULP against the NYC GMB. Tom Cat claimed the IWW was engaged in illegal secondary picketing. The evidence? The retweeted video. While the IWW’s pro bono lawyers did not agree that the retweet was sufficient evidence to claim that the union was engaging in a secondary picket or boycott, they recommended that the IWW settle the ULP due to the NLRB’s current makeup under the Trump administration, and the potential ramifications on free speech if the case was somehow lost. Pretty underwhelming, right? Yeah, we laughed, too. In fact, some of us have framed copies that give us a nice little chuckle every time we look at them. And you know what? That’s most likely what’s going to happen when your boss gets their ULP settlement, too — they’ll laugh at the inadequacy of it and keep doing what they were doing. Allies are still flyering in solidarity with the workers multiple times a week outside of restaurants that serve Tom Cat Bakery products. The video of the manager of Robert having a meltdown is still up on Twitter with the restaurant tagged. Did it really matter if the NYC GMB unretweeted it? By now, you may be asking: if ULPs are unreliable, why file them at all? Filing ULPs helps demonstrate an employer’s track record of slimy conduct and union-busting activities. Additionally, fighting a ULP ties up at least a small portion of the employer’s resources. The ULP is a useful tool, but it’s not a supplement for building solidarity with your coworkers, which we know is the foundation for winning in the workplace. We in the IWW still think that filing ULPs is a valid and important tactic for leveling the playing field with employers, but we believe this tactic must be part of a larger organizing strategy that focuses first on empowering workers on the shop floor and making immediate gains through leveraging worker power. Direct action can be organized and executed quickly, empowering workers to take on and resolve their issues immediately. Filing an Unfair Labor Practice complaint (ULP) can be a good tactic when used in conjunction with direct action; however, a ULP should rarely be relied upon as the sole means of resolving an issue with an employer.